This story has been updated. Find our most recent coverage here. Just months after winning an Olympic gold medal, Alaska cross-country skier Kikkan Randall found two pea-sized lumps in her breast. Medical tests confirmed she had cancer. She began chemotherapy in Anchorage this week. "It's been a roller coaster," Randall, 35, said Wednesday after announcing her diagnosis on social media. "Just like getting any tough news, you go through all the stages of denial and disbelief and frustration, but I always come back to the same skills I've used in my athletic career," she said. "I need to focus on what I can control. I need to be positive and optimistic." Doctors caught Randall's breast cancer in its early stages, she said. They told her the prognosis was good. But she will have to undergo six rounds of chemotherapy, one infusion every three weeks. Then she will have surgery. "It's tough for sure," she said, "especially coming off winning an Olympic gold medal. To go from that high, to barely two months into retirement, and then you find out about this, which just changes everything." 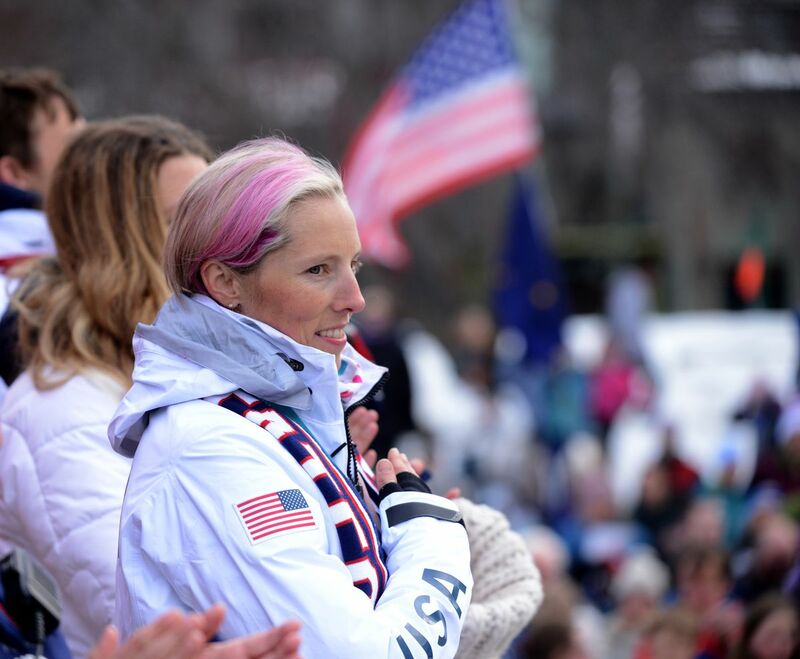 Randall made history at the Olympics this year in Pyeongchang, winning the women's team sprint race with Minnesota's Jessie Diggins. She and Diggins became the first American women to ever win a medal in cross-country skiing, and they won gold. It was Randall's fifth and final Olympics, and she had achieved what she worked toward for 20 years. It didn't feel real, she told reporters at the time. In photographs of her celebrating in South Korea, her trademark pink highlights in her hair peeked out of a headband. She wrote on social media Wednesday that pink "had taken on a new chapter" in her life. She had long used the color as a way to stand out and attract attention to her sport. Over the years, it became a good luck charm. "It's given me strength in the past," she said. "It's just so ironic that pink has been such a part of my life and now it takes on this whole new meaning." Randall said she plans to continue her treatment in Anchorage, the city where she grew up. She starred in skiing and running at East High School and is a longtime member of Alaska Pacific University's nordic ski program. She went on to compete for years internationally on the World Cup circuit, becoming America's most decorated cross-country skier. In April, Randall moved to Penticton, British Columbia, with her husband and their 2-year-old son. That's where she found the lumps in her breast. It was Mother's Day. "I had this great day with my husband and my son. We're in our new location, we went out and explored," she said. "I was getting ready for bed that night and I just happened to brush past it and thought it was my rib bone at first, just kind of a hard spot. Then I realized it felt more like a pea in there, or a marble. I already had an uneasy feeling about it." Randall said she's not aware of a history of breast cancer in her family. She has worked on many breast cancer awareness projects in Anchorage, she said, so she knew to go straight to the doctor if something didn't feel right. "We hear it time and time again, but the early detection is so crucial," she said. Randall said she hoped to eventually return to British Columbia between her rounds of chemotherapy. She said she promised herself she'd stay active, positive and determined during treatment. "I am going to bring as much tenacity, strength, and energy toward this challenge as I have throughout my entire career," she wrote on social media. On Monday, she rode her bicycle to and from Providence Alaska Medical Center in Anchorage. She wore her rainbow-colored "happy shoes." She said she's already brainstorming projects to share her journey to recovery, in hopes it will help others, including selling rainbow-colored socks and donating the proceeds. While she has let her pink highlights fade over the past few weeks, she said, she planned to have her high school friends help her reintroduce the color over the weekend before she loses her hair. "Then," she said, "I'm taking great suggestions for any pink wigs."